IEDCO Pneumatic Conveying Systems transfers fragile products damage-free and allows for automation, efficiency, labor savings, and solutions to many ergonomic issues. 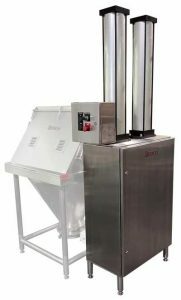 IEDCO offers a complete family of bulk bag unloaders designed to deliver powders into your process and fillers to get finished product into bulk bags. IEDCO solves bag handling issues by building and designing solutions that minimize potential injury, reduce dust exposure, and transfer bagged powders efficiently. IEDCO Batching Systems precisely weigh and dispense ingredients for further processing. These systems can be automated to any degree necessary and built with flexibility for future needs. IEDCO Drum Handling Systems provide efficient filling or emptying of drums with full containment while minimizing potential injury while maximizing efficiency. IEDCO offers a complete line of traditional “butterfly valve” type Intermediate Bulk Containers as well as IBC’s that can have its contents transferred via a vacuum conveyor. IEDCO Post Lifts easily elevate and position IBC's or large, heavy containers in a precise, safe and sanitary manner. Most of our lifts are powered either electrically or pneumatically. IEDCO offers a complete line of airborne contaminant control and containment solutions. These include isolation systems, containment booths, continuous liner drum fill systems and dust caps. IEDCO Valves control the feed of product into your system. Depending on the need we offer butterfly valves, rotary valves, tablet valves or vibratory feeders. When you empty bags you generate a lot of trash and removing the empty bag from the confines of the bag dump station to a trash bin generates spillage. Incorporating a bag compactor into the bag dump station can be the solution to this problem. The compactor can be configured into the side of the bag dump station or be designed to serve multiple bag dump stations - back to back or in line. When mounted to a filtered bag dump station, the bag compactor utilizes the dust collection system in the bag dump to keep the worker environment dust free during bag compaction.